Dawn on Tuesday saw a beautiful, expensive sunrise for Seattle, as we all learned that, while most normal human beings were sleeping, Russell Wilson and the Seahawks hammered out a pricey new contract extension that featured a ridiculous $65 million signing bonus and $140 million in new money for the quarterback. Every time any quarterback signs a big-time contract, people freak out about it on both sides of the ball. But the reality both Seattle and Russell should be happy about this deal, because it managed to give each of them exactly what they wanted. It’s a win-win deal. But there are also cascading effects all around the league as a result from this deal. Brady Quinn and I broke them all down on the Pick Six Podcast — it’s daily and sometimes twice daily when news like this breaks, make sure to subscribe on iTunes or on Spotify or on Stitcher — so hit that play button and double down with your content intake as you read through my choices below. If you want to keep a franchise quarterback on your roster, $30 million-plus is just the cost of doing business. 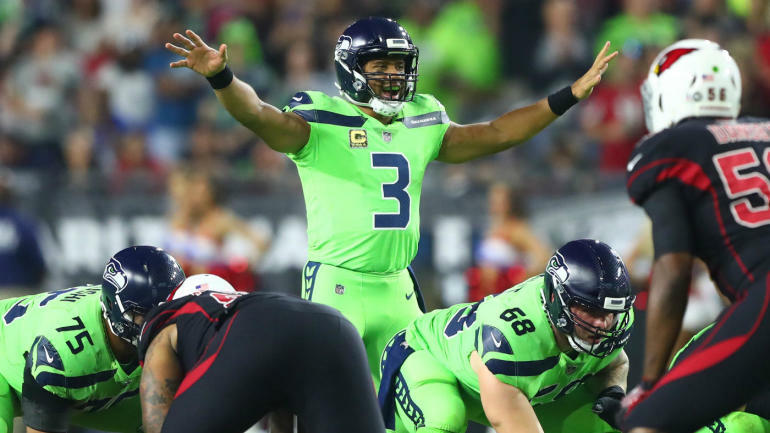 Losing Wilson would be a next-level nightmare: Seahawks fans would turn on the front office if they had decided to trade Wilson to, oooooooooh I don’t know, the Giants. And Carroll isn’t a spring chicken either; there have been (obviously unfounded) rumors of him retiring for a few years now and coaching without Wilson would crank up the difficulty level of making a Super Bowl run way past All-Madden. The Seahawks got this deal done without having to break from their normal structure of contracts, too, which is a huge win for the organization. That’s the compromise part of this — Russell, like Aaron Rodgers before him, didn’t shift the paradigm for quarterbacks doing business, he just got more money than anyone else. Duh. He’s the highest-paid player in NFL history and, for at least a couple of months minimum, the highest-paid quarterback in the NFL. People screamed about him not deserving more than Aaron Rodgers or needing to take something in between Matt Ryan and Rodgers and at the end of the day that was a laugh riot. Russell easily cleared Rodgers in terms of total guaranteed, average annual value, signing bonus and just about every metric you could imagine when it comes to a quarterback contract. And he did it all after flirting publicly with the idea of playing in New York, making it very clear he wanted to be the highest-paid quarterback in the NFL and giving the Seahawks a totally artificial and completely made-up deadline and having them hammer out a deal before the deadline. Russell wasn’t a big-time recruit, he had a messy separation from his first college, he fell in the draft and he’s been continually disrespected throughout his career when people are making lists of the best quarterbacks in football. He’s never lost sight of his goal (to be the greatest of all time) and he’s being paid commensurate with who he believes he can be. He deserves every penny of this contract. Nothing gives me joy like including Derek Carr on a list of winners. He’s a winner after all. But he’s also a placeholder here for any quarterback — Eli Manning, Andy Dalton, whoever — that could have been displaced by the Seahawks trading Russell Wilson. The Raiders weren’t heavily rumored to be involved in pursuing Russell in any hypothetical trade rumors, but they do have three first-round picks in this year’s draft and would be a perfect match for Wilson if Seattle wasn’t willing to pay him the money he wanted. (That isn’t the case obviously.) Guys like Carr and Manning still have to dodge bullets in the draft with Kyler Murray and Dwayne Haskins and other guys looming as possible replacements, but Russell is no longer a threat and that’s a good thing. Poor Dave Gettleman. He probably wasn’t even trying to trade for Russell, and yet he’s “losing” here because the Giants weren’t able to hammer out a deal. They probably never even had the chance! (Cue another smarmy Schneider smile when someone asks if he thought about trading Wilson.) But the Giants trading for Wilson would have been a dreamscape scenario for a franchise badly in need of a quarterback. Even if you had to pay multiple first-round picks and cause your defense to suffer as a result in 2019, adding Wilson to Saquon Barkley, Sterling Shepard, Evan Engram and an improved offensive line would give you an offense that is cooking with gas for the next five years. It would also help you bridge over from the end of Eli Manning’s career, although 2019 might have been really awkward. There might have been a problem with trying to figure out how you pay both Russell and Eli, but Giants fans didn’t care about the math, they just wanted the pipe dream shot into their veins. Now that dream is dead and they’ll have to focus on *checks notes* Daniel Jones with the No. 17 overall pick instead. Good times. Potshot out of left field at some NFC GMs! Unfortunately for these guys, though, they are next man up when it comes to quarterback contracts. Jared Goff (No. 1), Carson Wentz (No. 2) and Dak Prescott (No. 135) all stand out as 2016 NFL Draft picks who are now eligible for contract extensions, having wrapped up their respective third seasons. These guys are all successful professional quarterbacks at varying levels — Goff played in the Super Bowl last year, Wentz was an MVP candidate in his second season but has battled injuries and Prescott just keeps churning out division titles for the Cowboys (and he knocked Russ out of the playoffs last year). There’s been buzz about the Rams drafting another quarterback, about the Eagles sticking with Nick Foles and the Cowboys demanding Prescott take a “team-friendly deal.” None of those things are real. The reality is Goff, Wentz and Prescott are all going to demand top dollar from their teams if they play well in 2019 and negotiate a contract in the offseason afterwards. Maybe these guys won’t want more than Russell Wilson and Aaron Rodgers? That seems unlikely considering we’ve seen guys like Derek Carr earn top dollar at one point in time.